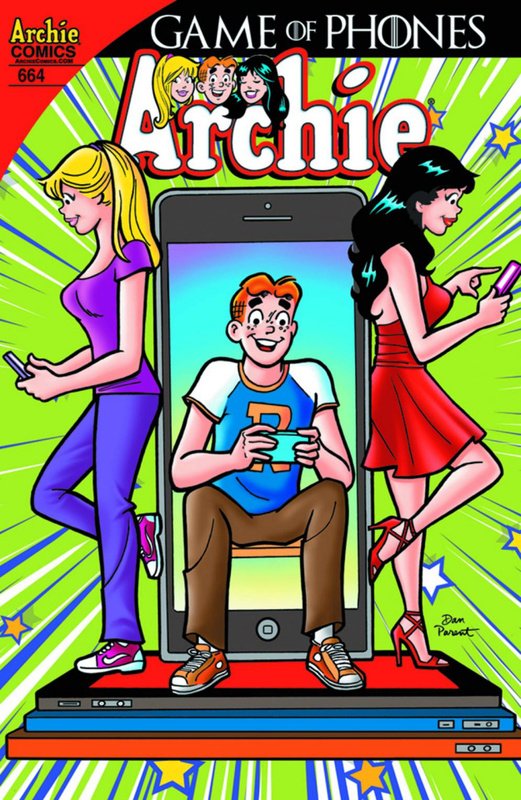 Archie in "Game of Phones": Winter is coming. A ten-year long winter, which means ten years of school without summer vacation! In a world of many kingdoms, the noble Archie Starch lives with his family and his pal Snowhead in the Kingdom of Riveros. Meanwhile, in the Kingdom of Lodgister, the wealthy princess Veronica Lodgister's greatest desire is to be this year's Prom Queen. Her main rival for the throne is a new girl in school, Princess Betty Cooparian. In yet another kingdom dwell the Braggians, with the pompous, sneaky Prince Reggie who is determined to do whatever it takes to become Prom King-even if that means faking his way to the top. Archie is ready to call his bluff and challenges him to a battle of the kingdoms on the Riveros High Football field. Which Kingdom will preside over all?